For those of us concerned about the preservation of our environment and interested in preventing ecological disaster, this dynamic exhibition by Wellington Point resident, Karen Benjamin, has much to offer. This creative environmentalist is concerned about the overuse and incorrect disposal of plastic, which she views as an ecological disaster. At present, 32% of all plastic packaging- bags, bottles, caps, straws, wrappers- escapes collection systems, finding its way into natural eco systems, including the ocean. Sadly, it is predicted that by the year 2050 there will be more plastic than fish in the ocean. With this alarming prediction in mind, Karen, with assistance and support from Redland City residents, has managed to save one million single use plastic bags from landfill and waterways. She has also created a number of fascinating items from various types of plastic. A number of these form the basis of her exhibition in the Dunn Wing of our Museum. The exhibition, appropriately named “Plastic Planet”, continues until the 23rd December, when the Museum closes for the Christmas break. 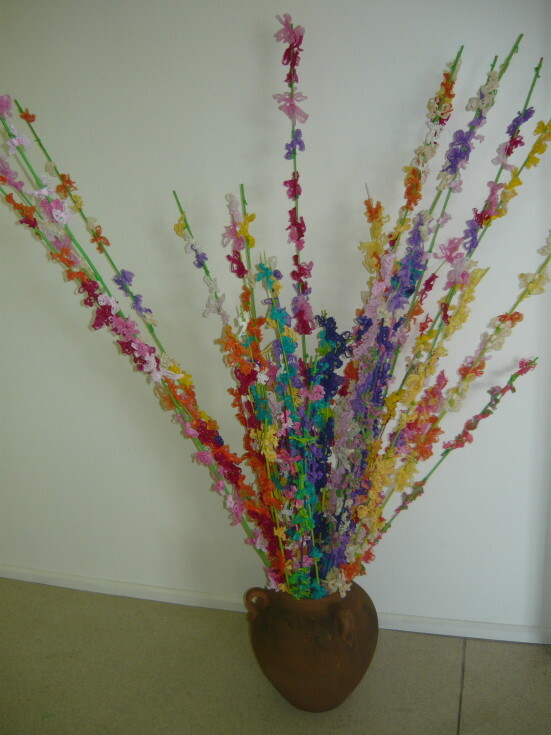 One example of the artist’s creativity and skill greets visitors as they enter the Dunn Wing: a large display of plastic snapdragons in a terra cotta pot. The flowers are made from small sections of plastic bags in shades of aqua, burgundy, pale pink, purple, orange and yellow. 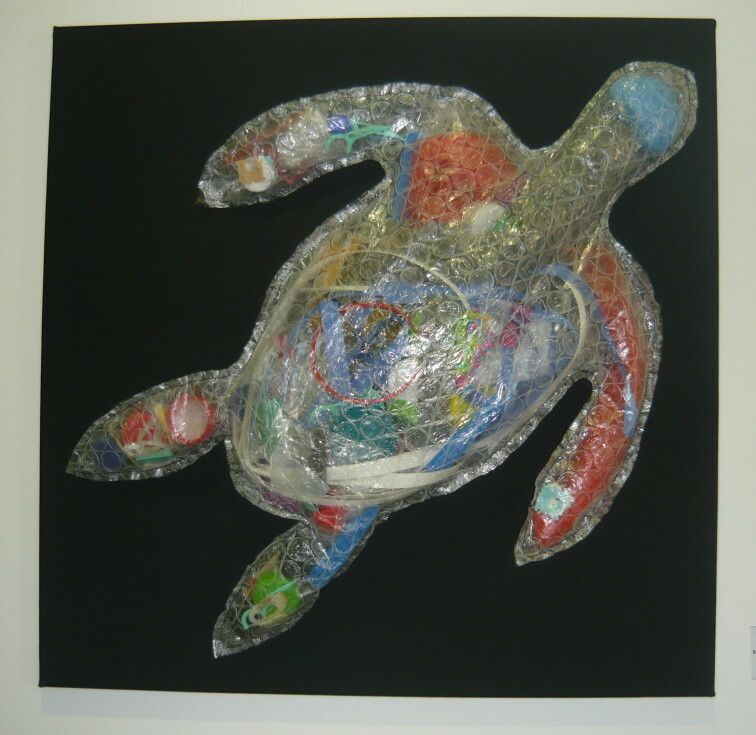 These are in sharp contrast to the adjacent item in the exhibition: named “Turtle Guts”, this is a turtle made of heat fused bubble wrap and filled with a number of plastic items which find their way to the waterways and are ingested by marine life such as turtles. Among this toxic diet are bottle caps, bread clips, buttons, packaging, pegs, wrappers… This item is confronting, but it does convey a strong message and warning. In order to ensure that “Turtle Guts” makes an impact on the viewer, it is preceded by four very bright and happy turtles! “Feeling Blue” and “Funky Fashions” offer another perspective. 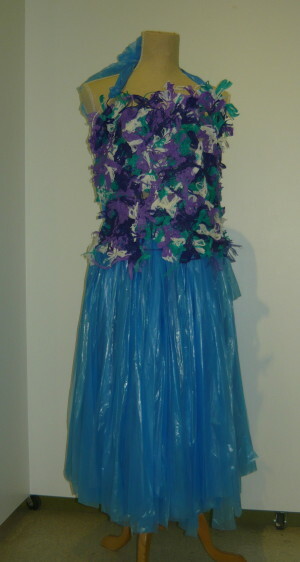 The bodice of “Feeling Blue” consists of fused plastic bags in shades of green, purple and white, while the skirt is made of strips of blue plastic bags which also form a tie around the neck and a sash at the back. “Funky Fashions” is a tiara made of blue bottle caps, fish shaped soy sauce sachets, buttons and parts of plastic bags which resemble brightly coloured flowers. 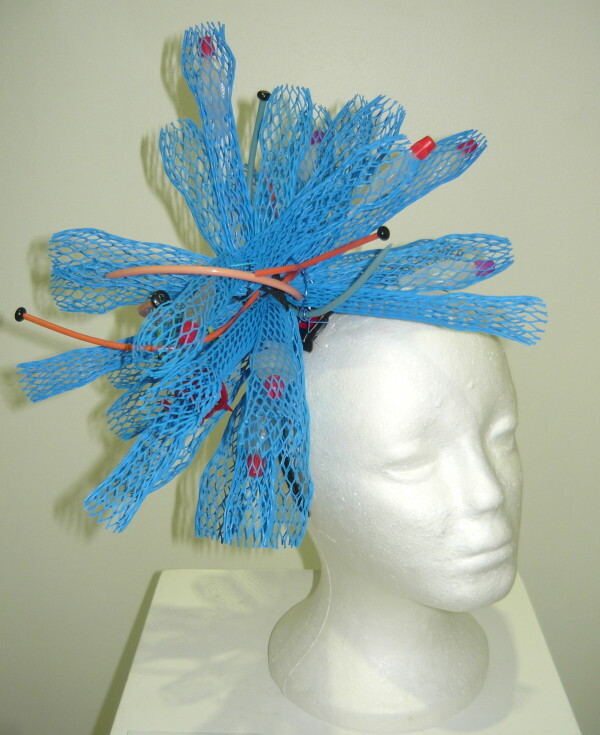 Another very intriguing item is “Caught Headpiece” 2016, which has the added distinction of incorporating blue plastic packaging with clear plastic Chinese soy sauce containers and orange and blue vintage knitting needles! Yet another example of Karen’s creativity and ingenuity. These are but a small selection of the items on display. Why not call in and see the entire exhibition?